Join us on June 7 to hear Rachel Stevenson discuss “The Growing Impact of LGBT Consumers in American Business Today”. 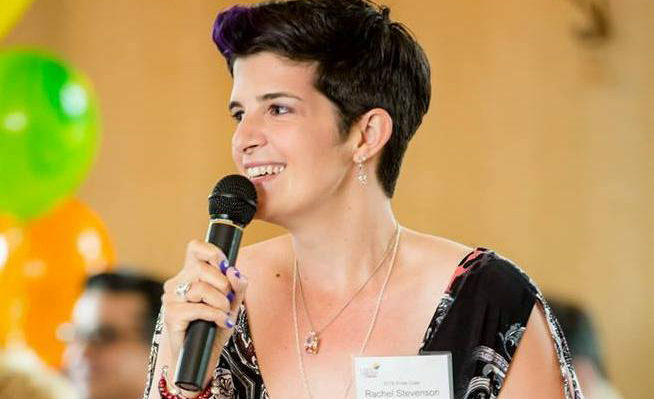 Rachel is an award-winning speaker, writer, diversity consultant and LGBT advocate. In Pennsylvania, she was the Founder and first President of LGBT Equality Alliance, an organization that creates safe spaces for the Chester County LGBT community, and a corporate diversity consultant to an international manufacturing company. Rachel moved to Florida in 2017 and quickly got involved. Within three months of buying her home in Gulfport, Rachel had created her newest company, OUTCOAST, which is composed of OUTCOAST.com, OUTCOAST Photography, and OUTCOAST Consulting. As the publisher of OUTCOAST.com, an online LGBT editorial marketing and media platform, Rachel shares LGBTQ stories and business news from throughout Florida’s Gulf Coast. She also works with LGBTQ-owned and inclusive businesses to market their service and product offerings through her platform. In addition, she freelances for Curve Magazine, an international online Lesbian magazine. An avid event photographer, Rachel has captured photos for LGBT organizations around the world, including the IGLTA, NGLCC, NLGJA, and Out & Equal. That is how OUTCOAST Photography was born! OUTCOAST Photography offers event, marketing, head shot, and travel photography services. Her work can be seen in restaurants throughout the region. And finally, through OUTCOAST Consulting, Rachel and her team help organizations create more inclusive spaces for LGBTQ employees through consulting, speaker services, and education. Rachel lives with her girlfriend, Margaret, and their three year old puppy, Pepper. Together, they enjoy boating, gardening, trying new local restaurants, and living the dream! “Work hard, play harder” is Rachel’s motto.